To make life easier for buyers on the auction floor, Manheim is separating car makes into four different streams in its 800 car Lex-Autolease sales. 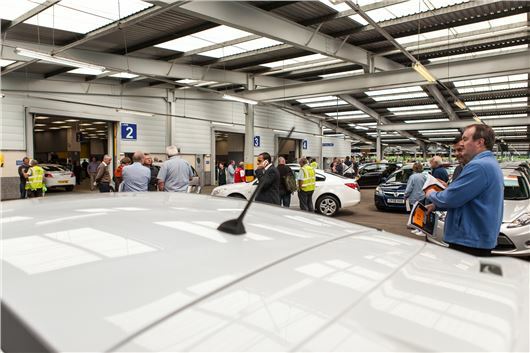 At its latest 'mega sale' of more than 800 vehicles at Manheim, Colchester, Ford, Vauxhall, Audi and VW each had their own separate auction lane. The 'four sales in one' concept was a first for the Manheim and Lex Autolease partnership, which also claims to have pioneered the mega auction sale and claims the accolade of holding the largest ever single sale in the UK. Hosting one manufacturer per lane meant buyers could easily identify which hall had the cars relevant to their dealerships. More than 82 per cent of the stock sold, achieving more than 97 per cent of CAP Clean, a market-leading sales result for the June holiday period. The mega sale was also the launch platform for a series of special summer activities for Lex Autolease and Manheim. First was the introduction of the new Manheim swipe and save reward card. Unique to the market, the card is being piloted at Lex Autolease sales throughout the country. It allows buyers to collect points for every Lex Autolease vehicle they buy to redeem against Manheim products and services. To support the new swipe and save card, Lex Autolease will be delivering another first by holding a summer road show of sales across every Manheim centre between July and October, culminating with a classic 1,000 vehicle mega sale at Manheim Colchester in October. The summer road show will launch on July 8th with an 'Around the World'-themed sale at Manheim Bruntingthorpe. Vehicles going under the hammer will represent the best of British, German, Japanese and American engineering. Dave Parry, corporate sales director at Manheim, comments: "We very much enjoy working with Lex Autolease because they are open to new and unique sales concepts and ideas that benefit Manheim's buyers. The pilot of the new swipe and save reward card is a first in the marketplace, giving something back to customers in return for their loyalty to both Lex Autolease and Manheim." Simon Rossiter, senior manager - Valuations & Auctions at Lex Autolease, adds: "We've now enjoyed three very successful mega sales with Manheim and, never one to rest on our laurels, we are always looking at how to differentiate the Lex Autolease brand and stock offering. The four in one sale certainly proved to be popular and we are looking to increase awareness of the Lex Autolease stock profile across the Manheim network over the summer with these new format auctions." For more information about the Lex Autolease summer road show, please visit www.manheimremarketing.co.uk.